Tiger Woods hits off the second tee during the final round of the World Golf Championships-Bridgestone Invitational at Firestone Country Club South Course on August 3, 2014 in Akron, Ohio. Tiger Woods suffered more back pain Sunday and withdrew after eight holes at the Bridgestone Invitational, struggling to even take off his golf shoes before being driven away to an uncertain future. In his third tournament since returning from back surgery, Woods injured himself playing a shot from the lip of a bunker on the par-5 second hole. After an awkward slash at the ball, he fell back toward the sand and landed with a thud and kept jogging out of the bunker from his moment. "I just jarred it, and it's been spasming ever since," Woods told a PGA Tour official before leaving. He kept playing, hitting a number of shockingly bad shots. He hit one shot into the water on the No. 3, some 30 yards short. He came up 65 yards short of the flag on a par 3. And from a bunker on the seventh hole, he blasted out through the green and into the fairway. After hitting a 315-yard tee shot into the left rough on No. 9, he grimaced at impact, slowly stooped over with his right hand on his leg, reached toward his back and struggled to even remove his tee from the ground. Moments later, he stepped into a cart and headed to the parking lot. At his car, Woods could barely switch out of his golf shoes. His caddie, Joe La Cava, drove him away. "It's just the whole lower back," Woods said. "I don't know what happened." Woods had back surgery March 31 to alleviate an impinged nerve, forcing him to miss the Masters for the first time and the U.S. Open. He returned June 26 at Congressional — three weeks ahead of his own schedule — and reported no pain at the Quicken Loans National, where he missed the cut by four shots, or the British Open, where he wound up 69th for his worst 72-hole finish in a major. 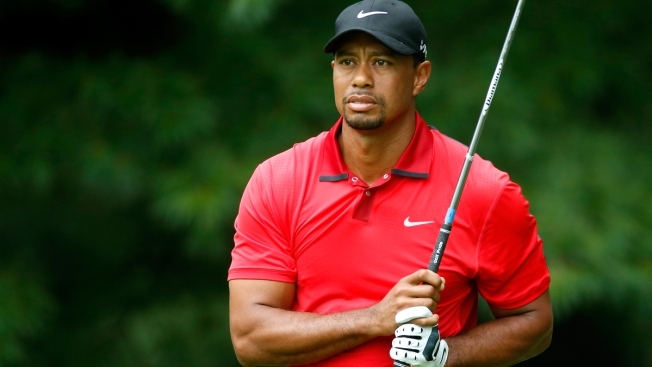 Woods was 3 over par for his round when he withdrew. He did not say whether he would be able to play the PGA Championship next week — "Just trying to get out of here," he told the tour official — though this surely would make it difficult for Tom Watson to consider Woods as a captain's pick for the Ryder Cup. Watson has said for the last few months that he wanted Woods on the team if he was healthy and playing well.